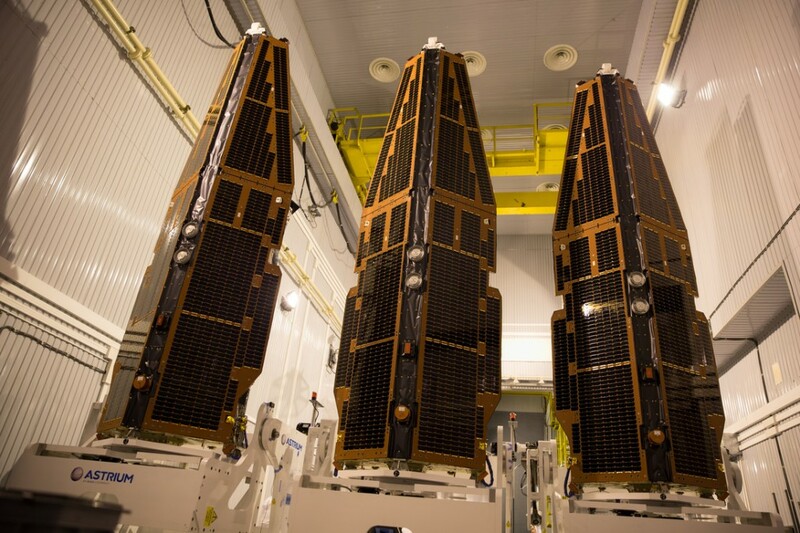 The three Swarm Satellites each weigh 472 Kilograms at launch including 106 Kilograms of propellant. Each spacecraft is 9.1 by 1.5 by 0.85 meters in size being designed with special focus on magnetic cleanliness, field vector attitude knowledge, a low ballistic coefficient and Center of Gravity location for accelerometer measurements. 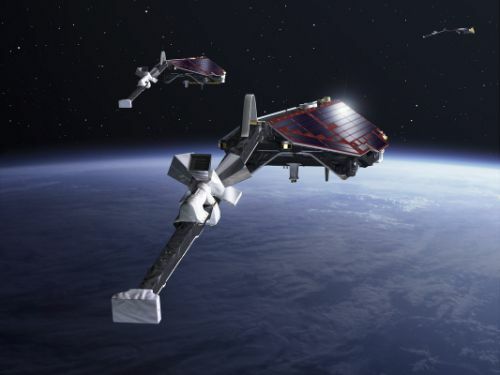 To meet these requirements, the Swarm satellites include a 4-meter long boom that is deployed in orbit to accommodate the magnetometer as far away from the satellite bus as possible, minimizing any magnetic disturbance. 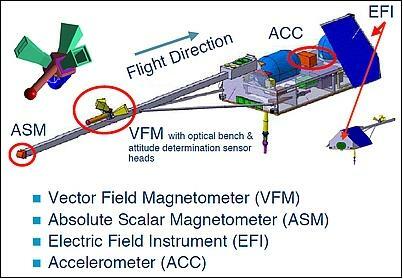 The vector magnetometer is installed on an ultra-stable silicon carbide-carbon fiber compound optical bench that provides a high thermal stability. The deployable boom is installed on the platform segment of the Swarm satellite that facilitates all spacecraft subsystems. The Swarm Attitude and Orbit Control Subsystem is closely coupled with the propulsion system called the Orbit Control Subsystem. Precise attitude data is provided by a star tracker assembly that consists of three heads, three magnetometers and six Coarse Sun and Earth Sensors that are used for pointing in safe and acquisition mode. A dual frequency GPS receiver is used to provide Precise Positioning Service for spacecraft control and the instruments as well as precise timing data for time-tagging. All sensors are redundant in architecture. 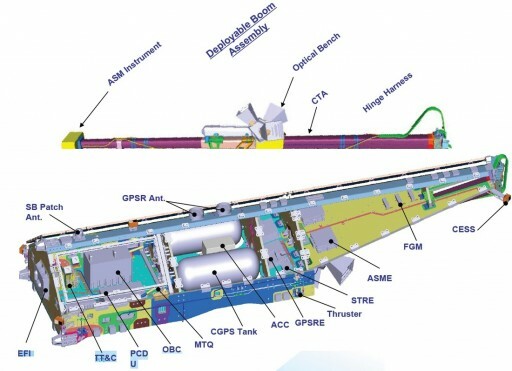 Data from the AOCS sensors is provided to the AOCS computers that actuate the propulsion and attitude control system. Swarm is equipped with three Magnetic Torquers to control the vehicle’s attitude while the propulsion system is used for attitude maneuvers and small orbit modifications. Swarm features a Cold Gas Propulsion System that consists of two propellant tanks holding 106 Kilograms of Freon-14 that is consumed by the SVT01 thrusters installed on the spacecraft. Swarm is equipped with 8 Orbit Control Thrusters and 16 Attitude Control Thrusters. The thrusters are operated at thrust levels of 20 Micronewtons for attitude control and 50 Micronewtons for orbit control. SVT01 thrusters are operating at a pressure of 1.5 to 2.5 bar to generate a specific impulse of 47 seconds. Each thrusters is 5.2 centimeters long and weighs about 60 grams. The thrusters are certified for 1.5 million duty cycles with pulse times as short as 100 microseconds. The propulsion system of the Swarm satellites is used for orbital maneuvers and attitude maneuvers. During nominal mission operations, the satellites fly in a nadir orientation using spacecraft roll, pitch and yaw rotations for instrument calibration and orbit control. Pointing accuracy of the spacecraft is two degrees on all axes. For safe-mode, the spacecraft enters Earth-pointing until being instructed to resume nadir-pointing. 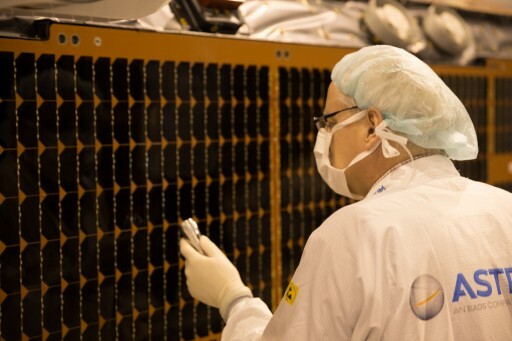 Each Swarm satellite is equipped with body-mounted solar panels for power generation. There are 32 strings of triple-junction Gallium-Arsenide solar cells that are installed on two external spacecraft panels. Power generated by the solar arrays is distributed by a Power Conditioning and Distribution Unit that controls the state of charge of 48-Amp-hour Li-Ion batteries and regulates the vehicle’s 28-Volt power bus with a range of 22 to 34 Volts. The solar panels provide 608 Watts of electrical power. Average satellite power consumption is 140 Watts by the platform and 50W by the instruments. 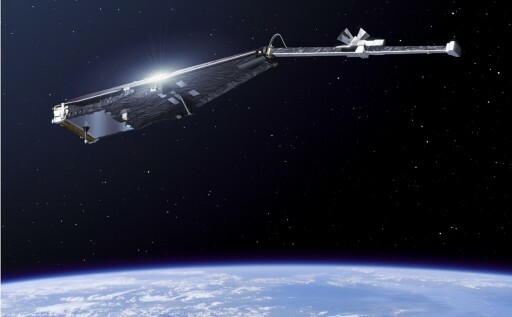 The Swarm satellites use a 1553 data bus for integrated data handling and the Attitude and Orbit Control System serving as the core of the system, processing and executing commands and receiving science data for storage and downlink. 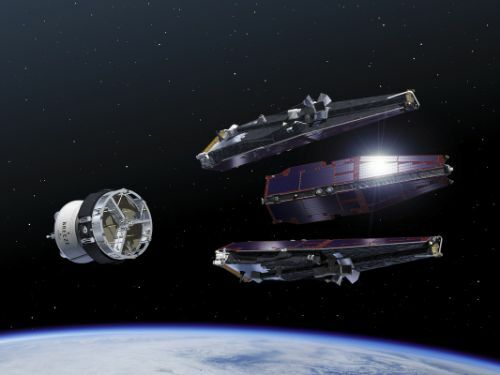 Swarm is equipped with two 16-Gbit solid-state mass memory units that store the 1.8Gbits of science data that are generated every day along with spacecraft housekeeping telemetry data. The instruments use an RS-422 data bus. The spacecraft use a 2-GHz S-Band Communications System for command uplink and telemetry and science data downlink. Swarm uses the Kiruna Ground Station in Sweden as primary tracking station. A downlink data rate of 6Mbit/s is achieved while command uplink is limited to 4kbit/s. Each Swarm satellite is carrying five payloads that are used to accomplish the scientific goals of the mission – making high precision measurements of the strength, direction and variation (spatial & temporal) of the Earth’s magnetic field complemented by accurate navigation, accelerometer and electric field measurements to provide data required for modeling the various sources of the geomagnetic field.